Looking for the best motherboard can be a daunting task. The problem starts when AMD or Intel launch a new family of desktop processors, such as the Core-X series or the Ryzen 7 1800x, which in turn introduces three or more new chipsets packed with fresh features. Then you have third-party manufacturers who generate at least four boards per chipset. For instance, Gigabyte now offers six motherboards using Intel’s new H270 chipset, 20 using the beefier Z270 chipset, and four using the just-off-the-press X299 chipset. Once you add in mother-manufacturers like ASRock, Asus, Biostar, MSI, and all the others, finding just the right motherboard for your next PC can be an overwhelming task. Lucky for you, we did a lot of filtering and feature comparisons for each manufacturer, and pitted those results against each other to create what we believe is a great list of the best motherboards you can buy for your consideration. Below you will find several picks for the best motherboards supporting AMD’s latest Ryzen desktop processors that fit into the company’s new AM4 socket. These processors are backed by new chipsets: X370, B350, and A320. However, in our search, we discovered that Ryzen-based motherboards aren’t priced above the $300 mark. That will likely change when AMD’s Ryzen Threadripper processor family and the X399 chipset hits the market in late July. On the Intel front, we provide what we believe are the best motherboards supporting seventh-generation “Kaby Lake” Core processors as well as the new high-end “Skylake-X” and “Kaby Lake-X” Core X-Series processors. This latter “extreme” group is backed by Intel’s new Z299 chipset whereas its mainstream seventh-generation processors rely on the company’s latest Z270 and H270 chipsets. But get ready: These boards can shoot past the $500 price range. This board consists of four memory sockets supporting up to 64GB of dual channel DDR4 memory. The sockets also support overclocked memory modules with base speeds of 3,200MHz, 2,400MHz, and 2,133MHz. They’re complemented by numerous storage-focused connections including one M.2 slot supporting SATA 3 (A-Series) and PCI Express 3.0 x4 (Ryzen) modes, and eight SATA 3 ports for standard storage devices. The board’s memory and storage capacities are joined by two PCI Express 3.0 x16 slots (x16 or dual x8), one PCI Express 2.0 x16 slot (maximum x4), and three PCI Express 2.0 x1 slots. This enables PC builders to install two AMD Radeon graphics cards in CrossFire mode, or two Nvidia GeForce graphics cards in SLI mode. This model does not provide any on-board video outputs. On the connectivity front, the Crosshair VI Hero provides plenty of options. Thrown into the huge USB mix are two USB 3.1 Gen2 ports (Type-A and Type-C) capable of data transfers of up to 10Gbps. Meanwhile, the board provides built-in Wireless AC (up to 867Mbps) and Bluetooth 4.1 connectivity. Additional features include 8-channel high definition audio, gold-plated audio jacks, S/PDIF output, support for water cooling, support for Aura Sync RGB lighting, and support for 3D printers. 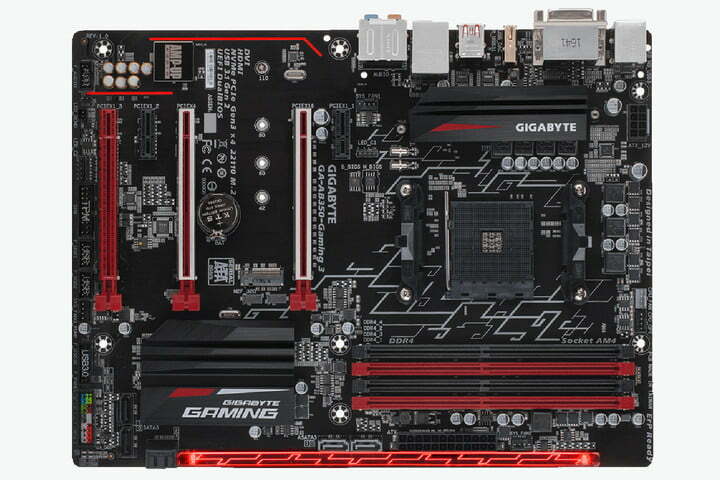 This motherboard consists of four sockets supporting up to 64GB of dual channel DDR4 memory. With a Ryzen processor installed, system builders can overclock memory sticks already running at 2,933MHz. Otherwise, AMD seventh-generation A-Series APUs only support 2,400MHz and 2,133MHz memory. Note that the memory sockets have 15μ gold contacts. As for other features, the board provides two PCI Express 3.0 x16 slots, and four PCI Express 2.0 x1 slots. This enables the board to support four AMD Radeon cards in CrossFire mode, or four Nvidia GeForce cards in SLI mode. Joining these slots is one M.2 slot for a Wi-Fi/Bluetooth module, two M.2 slots for stick-shaped SSDs, and six SATA 3 connectors for hard drives and standard SSDs. If that wasn’t enough bang for your buck, this Fatal1ty-branded board includes two headers for connecting RGB LED strips, support for Creative Sound Blaster Cinema 3, premium Blu-ray audio support, 7.1-channel HD audio, and a premium headset amplifier provided by Texas Instruments. There’s even two USB 3.1 Gen2 ports (Type-A, Type-C), and a dedicated Fatal1ty Mouse Port (also USB 3.1 Gen1 Type-A). This AMD Ryzen-focused motherboard from Gigabyte packs four sockets supporting up to 64GB of dual channel DDR4 memory. They’re also capable of supporting overclocked memory sticks with default speeds of 3,200MHz and 2,933MHz. The sockets are compatible with ECC un-buffered, non-ECC un-buffered, and Extreme Memory Profile-compatible memory modules. For add-on cards, the board consists of one PCI Express 3.0 x16 slot running at x16, one PCI Express 3.0 x16 slot running at x4, one PCI Express 3.0 slot running at x1, and two PCI Express 3.0 x1 slots. This setup enables system builders to install two AMD Radeon graphics cards running in CrossFire mode. Unfortunately, there’s no mention of using multiple Nvidia GeForce graphics cards running in SLI mode. On the storage front you’ll find one M.2 slot supporting SATA 3 or PCI Express 3.0 x2/x4 connectivity, depending on the stick-shaped SSD and processor. There are six SATA 3 connectors too, for hooking up hard drives and standard solid state drives. Other notable features include two USB 3.1 Gen2 Type-A ports, a water cooling CPU fan header, an RGB LED strip extension cable header, and integrated RGB Fusion lighting. Pretty!